Commonly used to add new electronics in mobile applications, these surface-mount fuse panels are cost effective and make the installation process easy. The standard, standard with cover, and the LED with cover have a common feed that provides power to all of the circuits with just one wire in. Maximum 60 amps per panel and maximum 30 amps per circuit. The compact with cover fuse panels offer a smaller footprint. Maximum 15 amps per circuit. The maximum amps per panel are: 30 amps for 4 position, 45 amps for 6 position, 60 amps for 8 position, and 90 amps for 10 position. The compact fuse panels have a IPX4 splash-proof rating. High amperage, two position fuse block. Made for high vibration rough duty applications. Waterproof. One common feed to two circuits. Measures 3.75" x 1.5" x 1.625". Uses FMX 20 to 60 amp fuses. Fuses sold separately. For large scale electrical installations in mobile applications, these surface mount fuse panels give you space for 20 circuits. 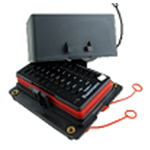 IP66 rated housing and cover provide a weather-tight enclosure for harsh environments. Measures 3.4" x 4" x 2.4", including the cover. Fuses/circuit breakers sold separately. Preassembled pigtails for OEM mini/ATM fuse panels can be purchased in any color or wire size in 6" lengths and simply inserted into the back of the panel on the RTMF-DC. Any circuit not being used should be plugged with Part #12010300 cavity plug to ensure weather proofing.